I don't recall much of Frost's poem "Mending Wall", but he hit it right on the head when he said "good fences make good neighbors". As many neighborhoods are experiencing expansion and growth, we're meeting many homeowners that are looking at other's backyards now where there was thick forest in recent years. Most people we meet with have good relationships with their neighbors, and even enjoy entertaining each other in their respective outdoor living areas from time to time. That doesn't necessarily mean they want to feel obligated to engage their neighbors in conversation every time the grille gets fired up. Build a Fence- This is the obvious solution to create privacy and provide a physical barrier between properties. Fences will keep the dogs and kids in and provide safety and security. 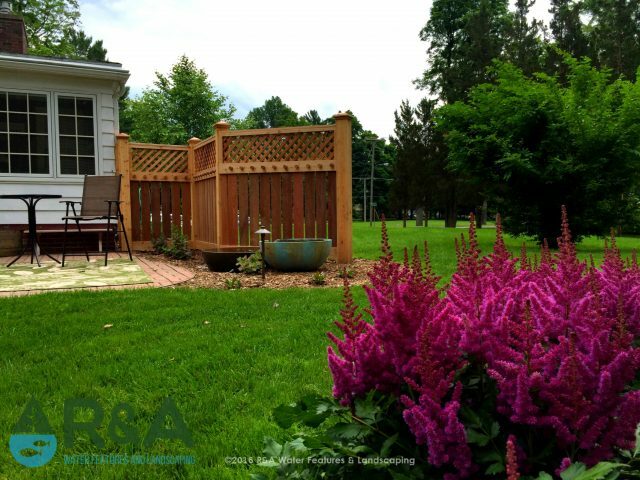 There are many types of fences, some requiring more maintenance than others, but the standard privacy fence is built at 6' tall out of wood or vinyl. Consider this height carefully while choosing a privacy solution. 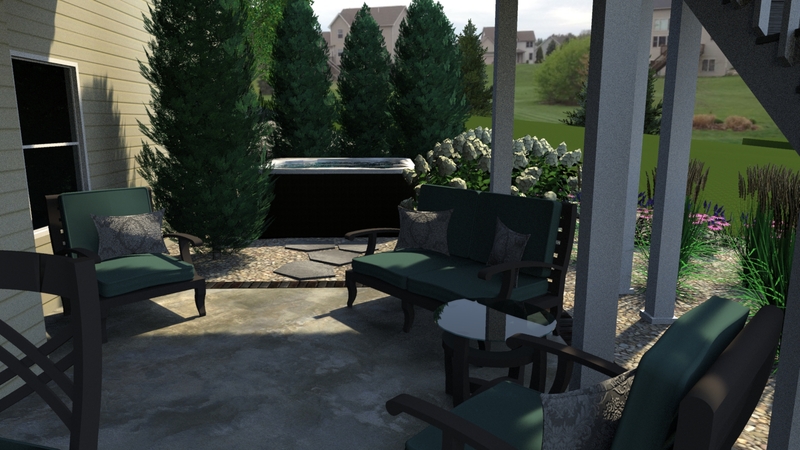 If you're sitting on a raised patio or deck surface, chances are a 6' barrier won't block, or even screen the view from the neighbor's property. Plant a Living Screen- For Pete's sake please don't go plant a row of Emerald Arborvitaes along your property line! Let's give this over-used evergreen a break...If it's a narrow evergreen you're after, try Techny Arborvitae. Or better yet, mix a few varieties of evergreen and get creative with the arrangement. This will not only look more appealing, but offer resistance to diseases that some varieties may be more susceptible to than others. Create a Naturalized Border- This is my personal favorite. While considering many factors, arrange a variety of deciduous and evergreen shrubs and trees in a fashion that mimics mother nature. Often times native species work best for creating the look of a truly natural screening, and incorporating some large natural stone can really turn this "screen" into more of a focal point. One more tip-get the neighbors involved! It might surprise you that they are interested in some privacy screening as well, and I have even seen neighbors spit the cost and work together! We are happy to be a resource for you as well. Please don't hesitate to give the design staff at R&A a call anytime to discuss your privacy project!